Over the past seven days, three separate hate crimes against Palestinians in Jerusalem have been documented, according to Israeli media sources. On Sunday, the Israeli paper Haaretz reported that “several dozen Orthodox men” began throwing stones, as well as tables and chairs from a sidewalk café, at Palestinian passersby near Damascus Gate in Jerusalem, in the al-Misrara neighborhood. At least five Palestinians were injured in the attack, and several vehicles were damaged. No arrests were made. Last Wednesday, in Gonenim Park in the Katamon neighborhood of southwest Jerusalem, which is traditionally a Palestinian Christian area, a gang of Orthodox men attacked four Palestinian students, all of whom are residents of Beit Safafa neighborhood in Jerusalem. Agwa suffered a broken nose and severe lacerations to his face and neck. Another survivor is in the hospital with a severely injured shoulder from having a cement block thrown at him. Eyewitnesses reported that the assailants used tasers on some of the victims. Four Israelis were arrested Tuesday for questioning in relation to the attack, but were released later the same day. No one has been charged. 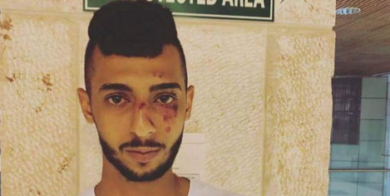 And earlier this week, in the illegal Israeli settlement of Beitar Illit east of Jerusalem, a Palestinian bus driver was assaulted by a gang of Orthodox youth, and badly beaten. Such attacks against Palestinians by Israelis are common, and are rarely prosecuted. According to the Israeli paper Ha’aretz, the recent spate of attacks coincides with the Jewish holiday of Sukkot – the paper added that the number of attacks against Palestinians by Orthodox Israelis usually spikes during Jewish holy days. No one was charged or arrested for that attack. These tensions hit a peak in 2014, when a gang of Jewish Israelis kidnapped, tortured and burned to death 15-year old Mohammad Abu Khdeir. Earlier this year, the family of Abu Khdeir filed a civil suit against his murderers for $1.5 million – “Not to make money, but so that these murderers will continue to be punished after they are released from prison”. Earlier this year, the Israeli Knesset (Parliament) passed a law declaring that only Jews have the right of self-determination in Israel and downgrades Arabic from its status as an official state language. Palestinians in Israel and Jerusalem have lost many rights as a result, and many say it has given racists license to attack Palestinians and engage in many types of discrimination – from employment, to housing, to schooling to shopping. 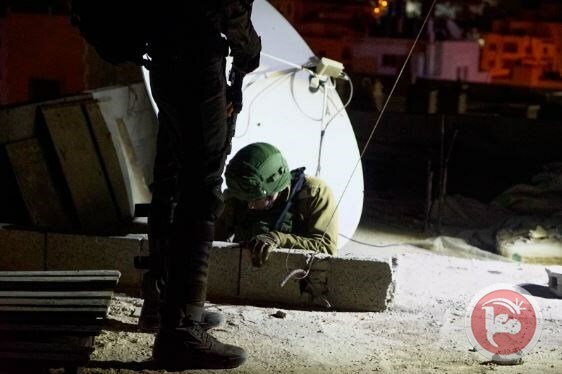 BETHLEHEM (Ma’an) — Israeli forces, along with Israeli army engineers, raided the Abu Hmeid family home, on predawn Wednesday, in the al-Amari refugee camp in the central occupied West Bank district of Ramallah. Locals said that Israeli forces escorting with army engineers raided the al-Amari refugee camp and inspected Umm Nasser Abu Hmeid’s home, mother of four Palestinian prisoners, a fifth accused of killing an Israeli soldier and another who was killed by Israeli forces in 2002.Israeli forces took measurements of the home, in preparation to demolish the four-story building, and ordered the Abud Hmeid family to evacuate the premises. Locals confirmed that clashes broke out between Palestinian youths and Israeli forces following the raid, during which the youths threw rocks and Molotov cocktails and Israeli forces fired live ammunition and tear-gas bombs. No injuries were reported from the clashes. Abu Hmeid’s son, Islam, was detained by Israeli forces in June and charged with stone throwing and accused of killing an Israeli soldier during clashes in which he threw a stone on an Israeli soldier, later killing the soldier. Abu Hmeid’s other has four sons, Nasser, 37, Nasr, 35, Sharif, 29, and Muhammad, 24, are currently serving multiple life terms in Israeli prisons for resisting Israeli forces during raids or clashes; Abu Hmeid’s sixth son, Abed al-Munim was shot and killed by Israeli forces in the Qalandiya refugee camp in 2002.Israel always demolishes family homes of Palestinians, who were involved in attacking Israelis as part of its collective punishment policy against the Palestinian people.Israel has come under harsh condemnation over the past several years for its response to attacks committed by Palestinians on Israelis, which rights groups have said amounted to “collective punishment” on family members and entire communities in a clear violation of international law. The Palestinian Cabinet during its weekly meeting on Tuesday reiterated full support to the speech of President Abbas at the United Nations, upholds the decision of the Palestinian leadership to appeal to the International Court of Justice (ICJ), and reviews the outcomes of the Ad Hoc Liaison Committee (AHLC) meeting. The Palestinian Cabinet, headed by Prime Minister Dr. Rami Al- Hamdallah reiterated its full support to President Mahmoud Abbas speech at the United Nations General Assembly (UNGA) and considered it a comprehensive speech that highlighted the core elements of the International Law, UN resolutions protecting Palestinian rights and the Arab peace initiative. In addition, it stressed that the Palestinian fundamental rights are not open to bargaining, primarily the right to self-determination and the establishment of an independent State of Palestine on 1967 borders, with East Jerusalem as its capital, and the importance of finding a complete solution to the refugees’ issue based on UNGA Resolution No. 194. The cabinet also announced to mobilize support for endorsing the initiative of President Abbas to hold an international peace conference this year, with the formation of a multilateral international mechanism to solve all permanent status issues and restore hopes for peace, and reaffirmed its total support to the Palestinian leadership efforts in submitting a new appeal to the International Court of Justice (ICJ) regarding the Trump administration decision to move its embassy from “Tel Aviv” to occupied Jerusalem in a direct violation to the International Law and globally recognized agreements. The cabinet welcomed the decision of the Group of 77, which represents 134 member countries at the United Nations, to endorse President Mahmoud Abbas and the State of Palestine to chair the Group in 2019. The Cabinet announced that the Palestinian Government would exert all possible efforts in cooperation with related bodies to facilities and achieve the objectives of the Group. The cabinet Discussed the meeting of Prime Minister Dr. Rami Al- Hamdallah with the AHLC held in New York last week. The meeting concentrated on building and strengthening the Palestinian economy by ending the Israeli occupation, which is the main obstacle to economic growth and development in the State of Palestine. The meeting stressed strengthening the rule of law, enabling the Government control over the so-called Area “C”, ending the ongoing, illegal blockade imposed on the Gaza Strip, and facilitating the transfer and flow of goods between the West Bank and the Strip. In addition, facilitating both exports and imports movement, expanding the fishing area in the Gaza strip, and maintaining access to implement solar energy projects, as well as reducing dependence on donor countries and ensuring access to natural resources in the West Bank and the Gaza Strip. Moreover, the meeting advised to carry investments in industrial areas and to review the Paris Convention and taxes system for Palestinian businesses. In this regard, the Cabinet noted that despite the reduction of international aid to more than 60%, and the illegal Israeli control of 65% of the Palestinian tax revenues, the Government was able to stretch its institutions over the past five years and to keep the debts of local banks at a minimum level of 10% of the GDP. Tax rates were reduced gradually from 20% to 10% for the vast majority of taxpayers too. The Government also succeeded to maintain its responsibilities towards its citizens, reduce spending and fiscal deficit from 15% to 4% of the national GDP. 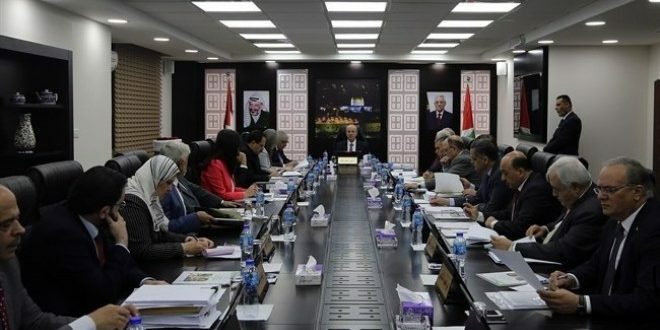 On another hand, the cabinet hailed the statement of the AHLC, which commended the financial performance and reforms of the Palestinian Government and welcomed the progress made by the Government in developing a long-term vision through the National Policy Agenda for the years 2017-2022. The AHLC also urged donor countries to cover the deficit in the Government’s general budget and to meet their financial commitment for the Gaza Reconstruction process. The AHLC stressed the need to end all outstanding financial files with the Israeli side. Moreover, the Committee urged both the Israeli and Palestinian sides to reach agreements on establishing projects that contribute to the development of the Palestinian economy, especially in the water and energy sectors. It also demanded that Israel should cease its restrictions against the Palestinian Government to enable its work in the so-called Area “C”. 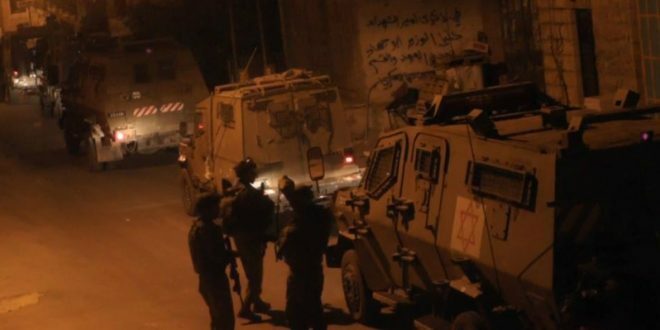 The Palestinian Prisoners Club on Wednesday reported that the Israeli Occupation Forces (IOF) arrested 14 Palestinians during raids on the occupied WEst Bank and Jerusalem. The PPC said that nine citizens were arrested from Jerusalem, two from Bethlehem, two others from Ramallah, and one citizen from Qalqilia. RAMALLAH, PALESTINOW.COM — Violent clashes flared up on Tuesday afternoon between Palestinian university students and the Israeli occupation forces (IOF) at Beit El checkpoint, north of Ramallah city. Eyewitnesses said that a number of students suffered breathing difficulties after they were attacked by the IOF with teargas canisters and sound bombs. The student movement of Birzeit University on Tuesday organized a demonstration toward Beit El in protest at Israel’s Jewish nation-state law and Khan al-Ahmar demolition. The Palestinian territories on Monday witnessed a general strike in all sectors, in addition to mass demonstrations and protests against the new law. Israel’s Jewish nation-state law defines the land of Palestine as the national home of the Jewish people where they exercise their natural, cultural, religious and historical right to self-determination. The law stipulates that the state’s language is Hebrew, and that the Arabic language has a “special status” in the state. It also says that the state will be open for Jewish immigration and the ingathering of exiles, encourages Jewish settlement, and views it as a national value. Palestinian anti-drug police yesterday seized a large amount of illegal drugs from the southern Gaza city of Rafah, Safa news agency reported. Director of the anti-drug police Ahmed Al-Shaer said that policemen also arrested three drug dealers. Al-Shaer added policemen used dogs during the 36 hour search, before uncovering a haul of hash and illegal narcotics. The drugs were confiscated and the three dealers were sent for interrogation. Speaking to Al Jazeera in 2016, the head of the local police anti-drug unit Ahmed Kidra accused Israel of plotting to “flood” Gaza with drugs, alleging that it “turns a blind eye” to narcotics when they enter into Gaza hidden inside commercial goods. The amounts seized in January 2017 alone equalled the total seized in all of 2016, Kidra said, citing nearly $2 million in seized hashish bars, Tramadol and ecstasy pills. At least seven Palestinians were injured Tuesday when the Israeli army fired on peaceful demonstrators in Gaza, Anadolu reports. The victims were wounded by live bullets, according to information gathered from a local hospital. Four of them were injured in the eastern part of Jabalia camp while the other three were wounded in east Gaza. Since the rallies began on March 30, scores of Palestinians have been martyred and thousands injured by Israeli troops deployed along the other side of the buffer zone. They also demand an end to Israel’s 11-year blockade of the Gaza Strip, which has gutted the coastal enclave’s economy and deprived its more than 2 million inhabitants of many essential commodities. Some 89 per cent of the population of Gaza does not have access to safe drinking water, the Palestinian Central Bureau of Statistics (PCBS) announced yesterday. According to the report, the PCBS said that only 11 per cent of Palestinian families in Gaza have access to safe sources of drinking water, compared to 95 per cent in the West Bank. Punitive measures imposed by Palestinian Authority (PA) President Mahmoud Abbas on Gaza was cited as one of the main reasons leading to the dire situation in Gaza. In 2017, Abbas imposed a number of measures on the Strip in an effort to pressure the people to turn against the Hamas government. The steps included halving salaries of public employees, forcing thousand of employees in to early retirement and stopping payments for the supply of electricity in to the Strip. PCBS statistics also showed that the Palestinian population in the occupied territories, including the West Bank, Gaza Strip and Jerusalem was 4,705,601 in 2017, 77 per cent of whom live in urban areas, 15 per cent in the countryside and eight per cent in refugee camps. The statistics showed that seven per cent live in houses where three or more persons share one room. Over 90% of #Gaza‘s water is unfit for consumption, with a mere 1 in 4 households receiving running water every day!